Eunice June Taylor a lifelong resident of this area passed away early Sunday, September 30, 2018, at The Villa Rehab Center. Born in St. Albans on June 22, 1926, she was the daughter of the late William and Tresa (Reed) Austin. Eunice was 92 years old. Eunice was married to Joseph G. Taylor, who pre-deceased her on June 9, 1983. Eunice was a longtime dispatcher for Fabe’s Taxi. Survivors include her nieces, Nancy Medor (Ellory) of Wisconsin and their children, Lisa Tott (Bryan), and Linda Olmstead (Steve) and Mary Jane Wheeler of St. Albans, as well as cousins, Donna Rocheleau of Fairfax and Dale Pouliot (Donald) of Westford and several step-nieces and nephews. In addition to her parents and husband, Joseph, Eunice was pre-deceased by her brother, Reginald Austin and his wife, Marcella, and Mary Jane’s husband, Roland Bruce Wheeler. Eunice’s family would like to thank the staff at The Villa for the care and support given to her and her family during her stay. Relatives and friends are invited to attend calling hours on Tuesday, October 9, 2018 from 10:00 AM to 11:00 AM at the Heald Funeral Home, 87 South Main Street, St. Albans. A funeral will then follow at 11:00 AM in the Heald Chapel with the Reverend Megan Stowe officiating. Interment will follow in the family lot in Holy Cross Cemetery. 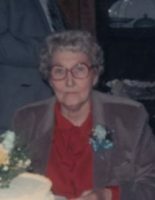 To send Eunice’s family a written expression of sympathy or share a memory, kindly go to her on-line guest book at www.healdfuneralhome.com.